The Eon Milan Counter Height Dining set truly delivers lasting natural beauty. Crafted from an innovative all-season resin that boasts incredible fading and weathering performance, Eon's premium products maintain their beautiful, natural wood-like appearance over their very long lives. Eon technology eliminates the frustrations associated with sanding, staining and painting. Eon is one of the finest alternatives to wood available on the market today. This beautiful Milan ensemble is comfortable and durable, and designed for easy assembly. The dining table measure 40" square and includes an umbrella hole. The stools are available in both Teak and Espresso finishes and are exceptionally strong. Counter Height dining seat height is in between a regular dining chair and bar height dining, therefore allowing for very easy access and exit. The Milan Counter height dining set is great for balconies, decks and terraces when the view is the main attraction! 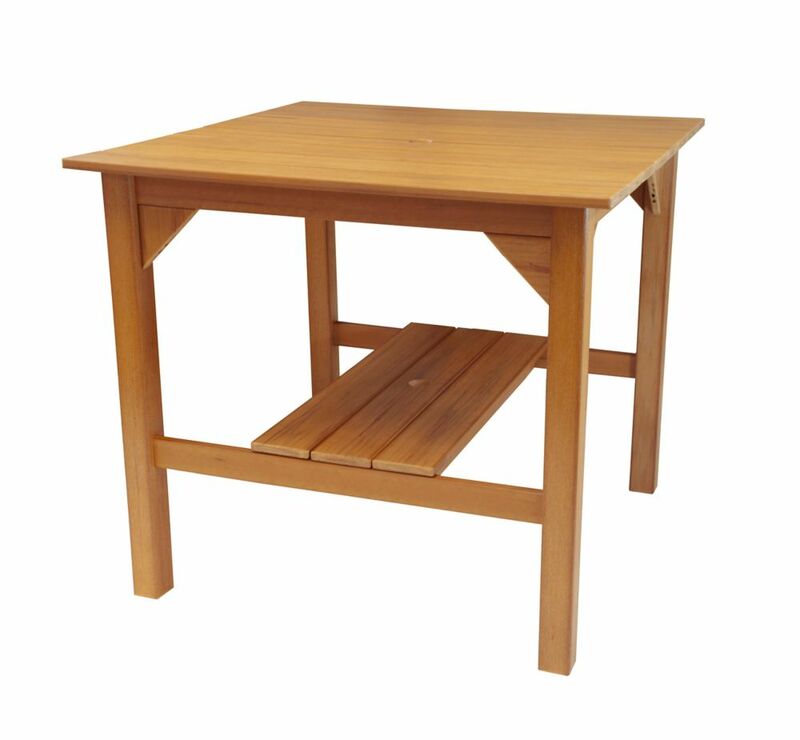 Milan Patio Dining Table in Teak The Eon Milan Counter Height Dining set truly delivers lasting natural beauty. Crafted from an innovative all-season resin that boasts incredible fading and weathering performance, Eon's premium products maintain their beautiful, natural wood-like appearance over their very long lives. Eon technology eliminates the frustrations associated with sanding, staining and painting. Eon is one of the finest alternatives to wood available on the market today. This beautiful Milan ensemble is comfortable and durable, and designed for easy assembly. The dining table measure 40" square and includes an umbrella hole. The stools are available in both Teak and Espresso finishes and are exceptionally strong. Counter Height dining seat height is in between a regular dining chair and bar height dining, therefore allowing for very easy access and exit. The Milan Counter height dining set is great for balconies, decks and terraces when the view is the main attraction!